Mahmoud Abbas captured the world’s attention with his controversial bid for U.N. recognition of Palestinian statehood. As the world awaits the outcome of that diplomatic contest, one of the key wild cards is the potential for mass nonviolent protest in the Palestinian territories. Some fear the failure of the bid will spark massive unrest and even the collapse of the Palestinian Authority. Others hope that Palestinians will rally en masse behind Abu Mazen’s strategy, using non-violent protest on the ground to supplement official Palestinian pressure on Israel at the United Nations. Both will be disappointed. The thwarting of the U.N. bid is unlikely to be a sufficient spark for protest. Few Palestinians expect the diplomatic maneuver to lead to concrete changes, so they will not be galvanized by disappointment when it does not. Furthermore, the political, institutional, and territorial fragmentation in the Palestinian national movement today curtails its capacity to establish a single goal and strategy to guide popular resistance. As I explore in a new book on the Palestinian struggle, movements need national unity in order to muster the sweeping participation that fuels nonviolent protest, as well as the collective restraint to keep it from being provoked into violence. Political cohesion is critical for mobilization to be mass in scale and sustainable over time. That cohesion is currently lacking on the Palestinian scene, though one never knows when the tenacious vibrancy of Palestinian civil society might create it anew. It may seem odd to argue that Palestinians are unlikely to engage in mass protest, given their deep history of popular mobilization and the many examples of creative grassroots activism on the ground today. These include West Bank villages’ ongoing protests against Israel’s separation wall, demonstrations against home demolitions in East Jerusalem, and the rallies last March demanding reconciliation between Fatah and Hamas, among numerous other undertakings that do and do not attract notice in the West. But there are several reasons why such instances of localized or single-episode actions do not add up to national mobilization akin to the revolts seen elsewhere in the Arab world. First, other uprisings in the region were propelled by the unleashing of frustrations that had been pent-up for decades. Palestinians, on the other hand, have had an uprising every generation. In this respect, the devastating toll of the second Intifada cannot be overstated. 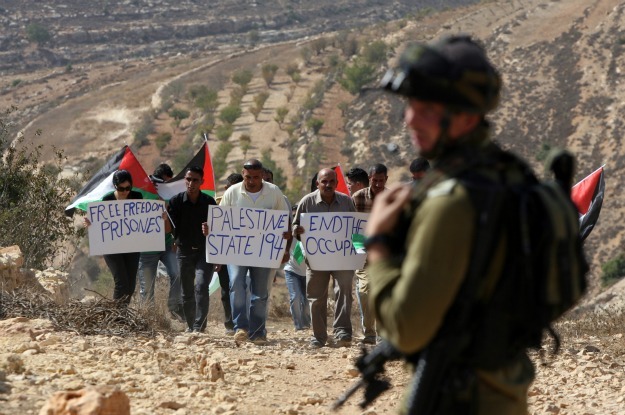 With more than 4,000 deaths and more than 5,000 prisoners in Israeli jails –apart from colossal economic losses, ravaging political and territorial fragmentation, and incalculable social suffering — Palestinians are wary of another uprising. Moreover, they are skeptical about its chances for success. A recent poll asked, “If a peaceful popular revolt like in Egypt or Tunisia were to erupt against the Israeli occupation in the West Bank, would it be capable of ending occupation?” Of Palestinian respondents, 64 percent said no, as did 72 percent of Israeli respondents. In contrast to other Arab publics, therefore, Palestinians are not alight with the thrill of reclaiming a long-suppressed voice. Rather, they are hoarse, and disillusioned, from shouting for so long. Second, different dimensions of space carry different implications for tactics. In Egypt, Yemen, and Bahrain, pro-democracy movements occupied a central square. In Tunisia and Libya, protest began in the periphery of the country and gained power as it moved toward the capital. In Syria, the protest movement still seeks to do likewise. The political geography of the Israeli-Palestinian conflict, however, is distinctive. If Palestinians have demonstrations in major towns in the West Bank of Gaza, Israelis will neither see nor care. Alternatively, Palestinians might have peaceful marches to Israeli checkpoints or settlements in the West Bank or toward Israel’s crossing-points into the Gaza Strip. These are militarized spaces, however, and Israel will treat them as breeches of sovereign borders. Even if approaching crowds of Palestinians are completely unarmed, Israel is likely to respond with force. And as cases from Palestinian history and across the world suggest, there is no surer way than repression to transform nonviolent protest into violent protest. Third, a different relationship between society and leadership is at play. The Arab Spring has seen populations revolt against unelected and ineffective leaders. Palestinians are also very critical of the Fatah and Hamas-led governments in the West Bank and Gaza Strip, respectively. Unlike the hollow ruling parties in Tunisia and Egypt, however, Palestinian factions have deep roots in society. They also have their own long histories of leading grassroots resistance that they can summon when political imperatives require. Fatah and Hamas might welcome popular mobilization as pressure on Israel, but they will go to lengths to ensure that it neither slips from their control nor evolves into a challenge against them. In fact, they might seize upon popular protest as a resource to co-opt and use to further their own ambitions within Palestinian politics. In this sense, any major Palestinian mobilization is less likely to resemble the unity on display in Tahrir Square than the divisions that bogged down Lebanon’s 2005 Cedar Revolution. In the latter, calls for reform of the sectarian system were stymied when sectarian parties themselves corralled adherents back to the bunker of factional loyalties. They thereby blocked street protests from becoming a threat to the domestic political status quo. To complicate matters further, the Palestinian Authority has a distinct interest in constraining popular resistance within the limits of its own political agenda. While it would like popular protests that increase its leverage in meaningful negotiations with Israel, it does not want any escalation that could jeopardize such negotiations. Even if the PA encourages demonstrations, it will try to prevent them from taking any form that might provoke Israel to respond with military force. It is not clear what a mass-scale renewal of Palestinian people’s power would look like if it becomes influenced, managed, or manipulated by the PA or any other of the parties competing for leadership of the Palestinian struggle. Certainly, it would be a different phenomenon than the grassroots resistance that unfolded elsewhere. Officially sanctioned rallies in Ramallah in support of the PA’s strategy might have the outward form of the Arab popular uprisings, but few will confuse them. In sum, we ought not expect an eruption of the Arab spring in Palestine any time soon. More fundamentally, it would be unfair of us to do so. Many who support Palestinians’ U.N. bid do so in the hope of (re)internationalizing the conflict. Primarily, this means taking the conflict to the international realm, as opposed to that of U.S. hegemony and bilateral negotiations. Yet “internationalization” in this case should carry another meaning, as well — that of placing expectations with the world leaders, as opposed to the Palestinian grassroots. Palestinian society has been engaging in various kinds of protest for nearly 100 years. It is rightfully exhausted. Over the course of the twentieth century, whenever the question of Palestine reached a point of stagnation, it was typically Palestinian civilian men, women, and children who shook things up by mobilizing the meager resources at their disposal. We should stop wondering if or when they will do so again. Rather, it is time for the international community to use the resources at its disposal to help bring about a just and lasting peace, once and for all. Wendy Pearlman is Assistant Professor of Political Science and the Crown Junior Chair in Middle East Studies at Northwestern University. Her second book on the Palestinian struggle, “Violence, Nonviolence, and the Palestinian National Movement,” has been published by Cambridge University Press in October this year.